Today was a monumental day. . . (okay, not really). 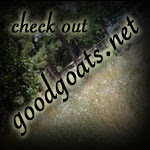 We've been milking goats since 2004, but we'd always dry up and have a few months where we weren't milking. Then January 25th, 2007 we had a doe kid and from that point on, we've always had at least one doe in milk, every day. So, if you do the math - that's 1,460 days and if we were milking 2x a day (which I think we were the whole time) that's 2,920 times to milk!! Yikes! I guess by now we've kind of gotten it (that is, milking... not exactly goat raising, especially in NE OK, haha!!) down to a science, somewhat - but you can never get too technical with animals 'cause they always have their own weird tweaks to them ;). So, it's really not that significant, but it is interesting (at least I think so!). Also, thanks to those who responded on the last post about the "hairless Wonder". I am going to try a few things, but the one that seems most plausible is iodine deficiency. I was also reminded that her kids were born full term but DOA... so not good and throws another thing into the loop. The test is simple, supplementation is pretty easy and her symptoms match it a lot. So I'm going to give it a shot. To test if a goat is iodine deficient - you just take Iodine Tincture and paint the inside of the goat's tail with it. If the stain is gone in 24 hours, they are deficient. You can supplement iodine this way if you need, but their skin will get irritated. Kelp is a good source from what I understand and I also have Organic Iodine (that is an oral feed product) that I might try if she turns up deficient. If she doesn't turn up deficient, then I'm going to have to move on to something else. Have a good night! I'll see if I can post again before the weekend, but my regular computer is at the shop and I have a busy/fun weekend ahead, Lord willing. So we'll see ;). 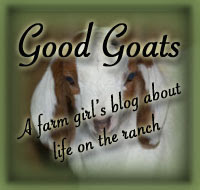 For those of you who have been following my blog since March of last year or longer, you might remember a post about a goat, "the Hairless Wonder". Well, if you don't remember. . .
She is a Nubian/LaMancha doe that was given to us mid-March of 2010 who we ended up naming "Wonder" (because we wondered why she lost her hair!). She was a first freshener, and had almost completely lost all of her hair over the course of her pregnancy. After she kidded, it had begun to grow back. The breeder didn't want to deal with it so gave her to us about a week after she kidded to see if we could help her out. She was in great health and weight (despite her hair being gone). So, along with the help of a few feeds (like black oil sunflower seeds) and a spray called Micro-Teck, her hair grew back and she milked great all summer long. I bred her 3 months ago and everything has been great. Until the other morning, I noticed that she had begun to loose hair again - both her cheeks on her face are almost completely hairless already. But as before, she is in good health - just is loosing her hair. So, obviously this has something to do with hormones, pregnancy hormones. 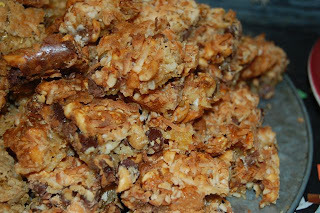 If any of you have ideas please feel free to comment and pass your ideas on - all are welcome. Right now the two things I am thinking of trying are 1) keeping a coat on her to maybe help stop or slow the hair loss, and 2) possibly starting high doses of injectable vitamin C and maybe B. I have heard that injectable C can do a lot of good things - worth a try at least, not going to hurt her. WELL, the new kids are doing good! It's a cold day today outside, kinda just doing small things in the house right now before it's time for evening chores. Well, Capering-Valley P Rhia finally kidded! She had a buck and a doe - both beautiful kids! Their sire is PawPawNin Junior Mint. She was having pretty hard contractions, and then I finally saw a foot. And then the foot went away and another bubble and part of the placenta came out... hmm, not exactly a good sign. So after a few minutes I felt in there and there was a nose and 3 feet - NOT what I was hoping to feel! So as usual, I talked Mom into going in ;). Thankfully they were not too tangled, I'm not sure how they weren't. But, Mom pulled the first one out - the doe kid. Then very quickly after that she pulled the buck kid out. I think it was a bit traumatizing/shocking to Rhia but I put a kid by her face and she started acting normal again (whew!!). Everyone is doing great now! The buck kid is of course the more colorful one ;). If anyone is looking for an F1 beautiful buckling, please email me. 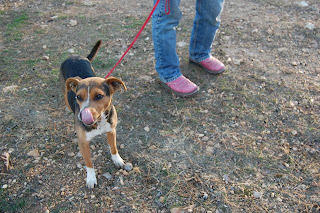 Otherwise he might be banded and go to a pet home. And the doe kid. If you're looking for a really nice doe kid, again, email me. We'll make you a deal ;). It's been snowing all night and still is on and off. We got probably 3 or 4 inches right now. Here's a few photos! In my last post I forgot to mention our new doe! Her name is Meesha. She is a beautiful Nubian doe, 2 years old. She just kidded as a first freshener about a week before we got her. 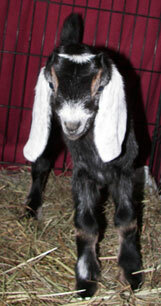 She's super sweet and actually seems big to me for a 2 year old, but that could be because I am used to Mini Nubians. She's a bit stressed out but hopefully within the next few days she'll settle down and start to eat more of her grain (thankfully, she's eating hay and a little grain still). 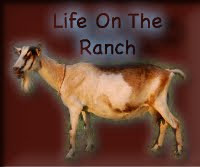 Well, there have been a lot of ranch happenings around here the past few days. Just odds and ends though. Of the 4 goats with the banded horns, 3 are now completely hornless and 1 has one horn left to fall off. This process went very smooth and if done correctly, I would suggest this method of dehorning (only if you get a goat that already has horns - if you have kids born, disbudding is of course a much easier and quicker method) and would do it again myself. Between Friday afternoon and Saturday afternoon, we added something like 23 animals to the ranch. YIKES! My family is crazy, I'm tellin' you!! A few were donkeys that we hope to resale, they are pretty looking guys (and a gal), I think. . .
And then 10 were sheep (and a little goat came with them). They are Shetlands and Shetland crosses. They look like cotton-balls with toothpick legs, LOL. I think they're kinda cute though! If anyone is in the market for Shetlands, email my mom here. Gotta go! Have a great day! The little cria is doing great. He is so sweet and friendly! He nibbles and licks my face and really likes to be petted, just too cute! And he is definitely making his momma be a lot more comfortable around humans. I've been keeping them in the back stall because it is just too cold out there for him. Saturday it was sunny tho so we let him run around in the front yard for a few hours. Today I put him out in the snow for a little bit, but after bucking and kicking for a little while he got a bit chilled so. . .
. . . back in the stall they went! Oh, and he needs a name! The only name that someone came up with that I like so far is "Saltine". His mom is "Salty" and his dad was "Bill." Yesterday they (2 of my brothers and my cousin, the ones who break horses) thought they might have a horse that'd buck, so mom went down there with the camera to hopefully get some "action" shots. But, no bucking. Just a lot of running. Still cool ;). No more baby animals of any kind yet. . . but there are a few does and ewes lookin' like they just might pop soon! This morning I was loading hay and went to let the girls (does, ewes, llama...) out to pasture and saw a foot sticking out of the llama!! Yikes! Our male llama left about 11 months ago, so he must've bred her right before he left! This was our first llama birth, but thankfully I've read a fair amount online about llama births (and I've attended a TON of other animal births). She pushed his head and front feet out, and she let me come over and clean his nose off so he could breath. A few minutes later, she pushed the rest of him out. Normally she doesn't like me near her very much at all (unless I'm feeding her grain! ), but she let me clean him off and make him a bed of hay, because he was flopping *everywhere* and getting covered in dirt, which was kind of freaking me out a little!! 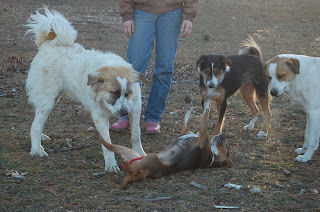 I stayed calm tho (thankfully), because word had spread and several neighbors had come over to watch :)! And llamas don't lick their babies (crias), so it was good that she let me help. So when I was done cleaning him off and she wanted me to back off, she let me know ;). So, that was really exciting! We've seen him nurse several times now and Mama Llama is being very watchful and protective of him! I've gotta get off of here and do a few things, have a busy night, and I gotta make the cria a coat! Last night around 2am we got up and checked on Rosie, and sure enough, she was pushing! After a little while, she plopped out a huge buckling... haven't weighed him, but I'm guess he's a good 10 lbs. Their sire is our Boer buck, Ace. A little while later, she pushed out another *buckling* who came out back-feet first, which I think was easier since their heads and shoulders are so big! Here's a few photos! this is a bad picture... I know... but I was really tired and hoping she'd get done quick!! The night before last, around 1am something, we were awoken to a screaming goat - again. The goat that was the first to knock off one of her horns, knocked her second one off - so now she is completely hornless! Woohoo!! She just has 2 scabs on top of her head, not bad at all! 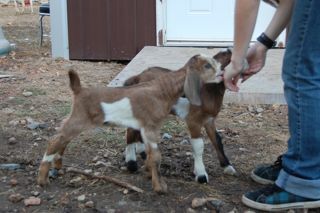 Then 2 of the others just have one horn left, and the last goat still has both. She is the biggest out of them all so I'd expect hers to take the longest. And no babies yet from Miss Rhia. She's looking like she'll go soon though. . . hopefully soon enough so they can be on the same bottle schedule as these other kids are, but that's probably too much to hope for ;)! Happy New Year to everyone!! We had a big ole party last night, as usual on new years eve. 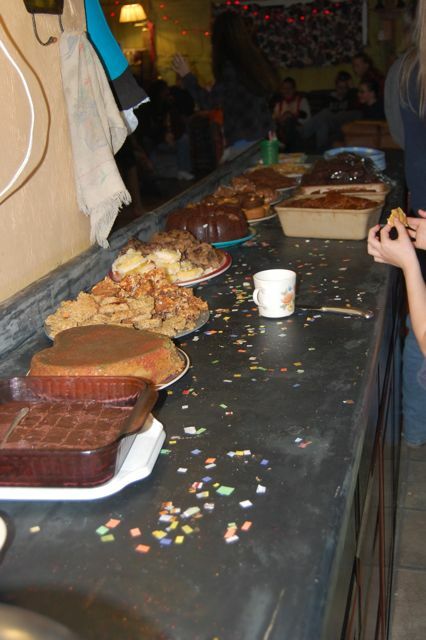 there was lots and lots of yummy food! Rosie and Rhia are due any day. . . day 150 is tomorrow for Rosie. They are both looking bigger and more uncomfortable every day but no babies yet. 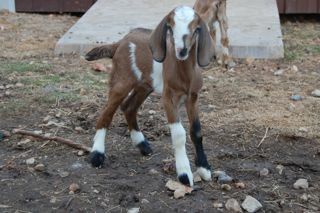 For an update on the 4 goats we are dehorning - we now have 3 "unicorns", woohoo!! The last 2 that fell off weren't as traumatic as the first ;). 3 horns off, 5 to go. So for the rest of the day today, we just kind of relaxed. 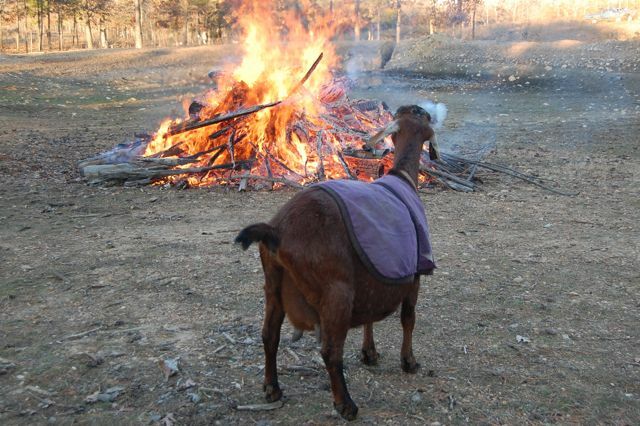 My brother had a bunch of wood to burn outside, so I took Roxie out to run around and the goats were out there too. 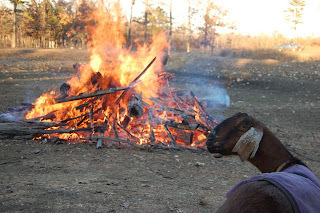 "Grandma", the goat, really liked the fire and was just standing next to it warming up... she's such a cute old goat! Well, have a great night and a happy new year!